Update (6/12/14): The current public offer is 40,000 points plus 5,000 points for adding an Authorized User. If you’d like to sign up for the card and support this site please let me know and I’ll send you a referral link from my account. You’ll get the best offer available at 40k plus I’ll get a 5k bonus for referring you. Offer ends 6/30/14. People that know me know how I like to rack up credit card points. And if you’re interested in how I do it, you can read my three part series on credit card churning and travel hacking. You should know though that it’s not as easy as other people or even myself make it seem. It’s a lot of work to apply for and redeem credit card points across multiple networks and airlines which is why travel hacking isn’t for everyone. But luckily, I’ve done all the work for you with this deal. This offer is perfect if you’re looking to dip your toes into the travel hacking water or just make some quick and easy money. I actually don’t have this card yet since I’ve been waiting for a better bonus to come out so I’ll be applying for it soon. If you’re thinking about buying a house in the next 6 months or applying for any big lines of credit you probably don’t want to mess around with applying for a new card. But if there are no imminent purchases on your horizon, opening and canceling one or two cards a year will have very little impact on your score. The Chase Sapphire Preferred card is one of my favorite cards since it offers a very lucrative sign-up bonus and it’s extremely easy to redeem those Ultimate Rewards points. If you sign up for an airline credit card like the Southwest Airlines Visa which also offers a 50k sign-up bonus, you can only redeem those points 0n Southwest. But the CSP allows you much more flexibility: you can redeem points for cash, gift cards, flights on Southwest, flights on United, hotel rooms with Hyatt, and more. The annual fee on this card is $125 but it’s waived for the first year. I don’t think this card is worth it to keep beyond the one year period so I’ll probably cancel or try to downgrade after the annual fee hits. Go here to apply for the card. Make sure you take a screen shot of the offer page in case Chase tries to pull a fast one on you later on. If you’re instantly accepted, then you’re done and you can move on to step two. If your application goes pending or you’re denied for some reason you should immediately call the reconsideration line at: (888) 245-0625. If you’d like an additional 5k points, add an authorized user and make at least one purchase with that card(you don’t even have to give the AU their card). Notes: You cannot apply for more than one Chase card within 65 days so if you’ve applied for a Chase card recently, you’ll need to wait. I found the sign-up link above on a Flyer Talk thread, it’s not an affiliate link btw. The offer came right up for me when I clicked the link, but some people reported having to try different browsers or computers in order to get it to show up. Redeeming points with Chase Ultimate Rewards is super easy and 55,000 points will get you an easy $550 cash back via statement credit. If you’d like to stretch your points a little further you can book travel for a 20% discount so 55,000 points should get you around $650 worth of travel. For the best redemption rates, you can travel to airline or hotel partners. I like transferring Ultimate Reward points to Southwest and Hyatt since if there’s a flight or room available you can always book it with points. Redeeming points on airlines like United can be very frustrating to say the least. Since the annual fee is waived for the first year, there’s no point in canceling until the end of that one year period. But before you cancel, give Chase a call and see if they’ll waive the fee or let you downgrade to the Chase Freedom card. If that doesn’t work, go ahead and cancel your card. I usually set a reminder in my calendar to let me know when an annual fee is coming up. With Chase though, they’ll actually give you a 2 month grace period after your annual fee hits to cancel your card and still get the free reversed. Make sure that you use your points before you cancel the card though! If you’ve made it this far, you can see just how easy it is to make $550 with this offer. Like I said before, managing a couple cards is pretty easy and all of the work involved here should take no less than an hour. So I don’t know about you, but I don’t make $550 an hour(actually more since it’s tax free) yet so this seems like a pretty awesome deal to me. 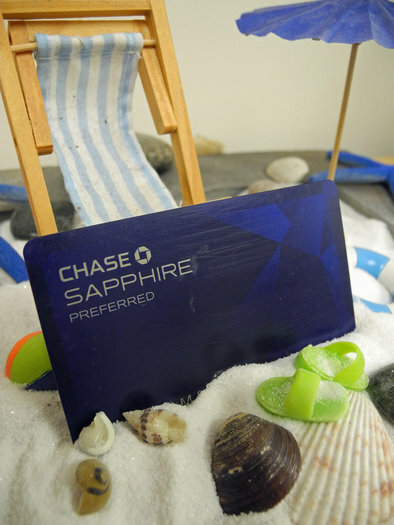 Readers, what do you think about the Chase Sapphire Preferred Card? Is it worth the tiny credit ding to make $550? If you’d like to sign up for the card and support this site please let me know and I’ll send you a referral link from my account. You’ll get the best offer available at 40k plus I’ll get a 5k bonus for referring you. Offer ends 6/30/14. Is it worth the tiny credit ding to make $550? Umm, yeah! LOL. Thanks for sharing this. I figured I could do 2-3 deals like this in a year plus the cash rewards I get from my Costco Amex and Paypal Plus, and I could take my family to a nice vacation. Haha that’s what I’m saying. It literally takes just a few minutes to do these types of offers and as long as you only do 2-3 a year, your credit score will barely be affected. Glad you were able to take advantage of this offer. I applied and was approved, thanks for the link! We just finished churning our SPG card so I wanted to do this one too. $3,000 in three months is a little tight but I know if I transfer over our recurring charges to this card plus with Christmas spending, we can get the reward. No problem, congrats! Check out my articles on manufactured spending. You can easily set up two amazon payment accounts and meet the spend req’s that way. Oh nice, yea I’ve heard that they are pretty good about waving the fee or letting you downgrade to the paid version. Unfortunately you can’t churn Chase cards but you can sign up anyone who trusts you haha. My friend just signed up both of his parents! I didn’t take a screen shot like an idiot, and chase is giving me the run around. Is there anyone that has a Screen shot of this? PLEASE! I don’t have the screenshot for this card but I’m sure you could find it on the Flyertalk thread.